A couple of friends forwarded this video recently, and I loved it. While it isn’t directly related to fundraising, it’ll make you feel good. AND, you might take a few moments to think about how this concept could translate into your organization’s next video project. I dare you not to enjoy it! This Ain’t Your Usual Acknowledgement Letter! Two very different situations led to full-page ‘thank you’ advertisements recently. . . . different types of gifts, different reasons for the gratitude, and different approaches to the message itself. First, we have a message from the Japanese Prime Minister, Naoto Kan. His message of gratitude was placed in numerous newspapers around the globe. Next, we have a full-page advertisement in the New York Times, placed by the University of Southern California celebrating the recent $110 million gift for the Mork Family Scholars program. 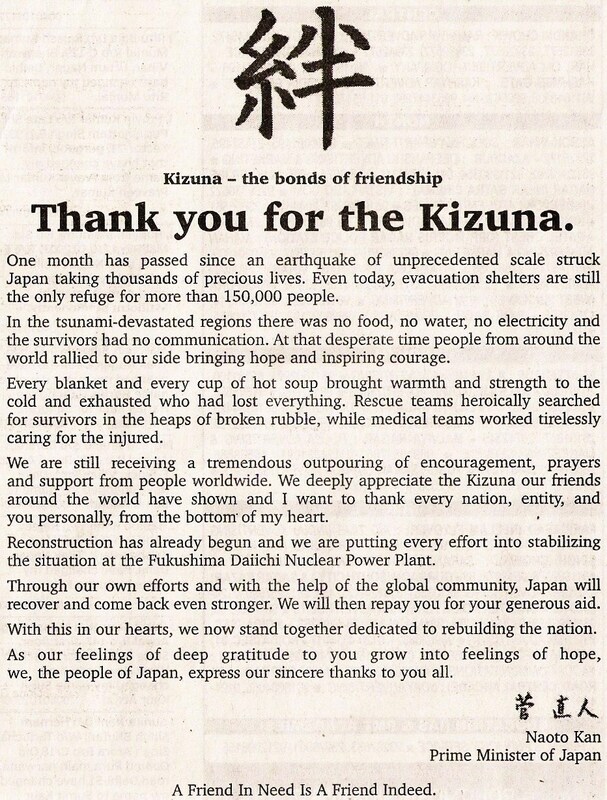 Frankly, I was amazed the Japanese advertisement didn’t get more attention. I can’t remember a similar action before, and I thought it was an extremely classy move. There are so many foreign aid projects, and we (along with others) are quick to help whenever a disaster strikes. Being thanked made me feel good. So, Mr. Prime Minister, thank you for the thank you! Mission accomplished. 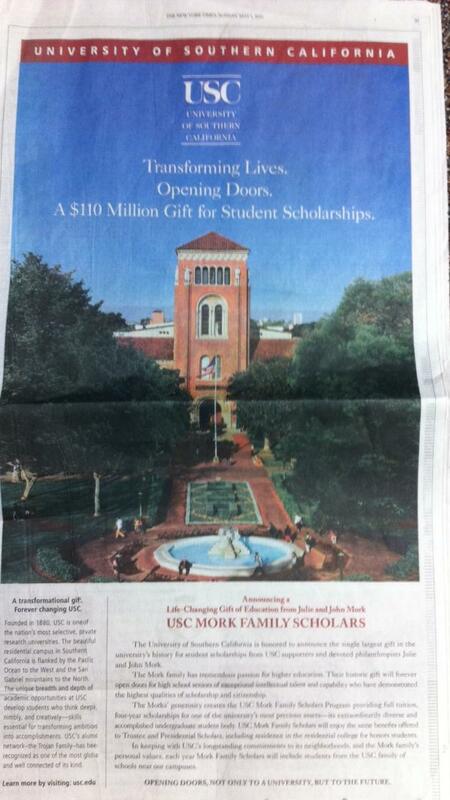 The USC advertisement is a lot more than donor stewardship. While I’m sure it doesn’t hurt for the Mork family to see this in the NYT, the benefit stretches much further. Prospective students see opportunity. Prospective donors may be motivated to think big (not just at USC, by the way) and the world stage sees something great happening at the University of Southern California. A full page in the Sunday New York Times isn’t inexpensive, but I guess if you’re going to do it, a $110 million scholarship program would be the time! What do you think? Strategic allocation of resources or big waste of money?